The World Wide Web has been a central part of many of our lives for a decade or more now. Many things about the Internet have changed dramatically during this time, but one thing hasn’t. Parents and teachers want children to participate in all the Web has to offer, but they want to keep them safe in the process. Back in 1995, Bernie Dodge and Tom March of San Diego State University thought of a way to accomplish the seemingly contradictory goals of safety and access. They created the WebQuest. You've just been offered your dream job. You are going to be the star VJ (Video Jockey) on MTV. Your picture will be in People magazine, and you'll have lots of screaming fans. There's a catch, however. You're the host or hostess of MTV all right—for another century! You'll get out there on stage and introduce the music of Bach, Mozart, Beethoven, Stravinsky, or some other dude you'd rather not be caught dead listening to. You're going to have to do a little research to pull this one off, my friends. There's got to be a piece by each of these guys that will excite your audience. Maybe if you set the stage with a little history of the musical period as well as a biography of the composer, there will be greater appreciation. You will need to decompress them before you can use them. After completing your research, each team should present an MTV show from a particular period in music history. You will choose a host, present introductory material about your time period and composer, and play some music that represents the style. Do you think there is no good classical music? Your task is to prove that this premise is wrong. There are lots of classical music pieces that make the foot tap and excite the blood. You'll have to be creative to prove the point, though. Maybe your host can dress up in the style of the historic period your group represents. Conversely, you can present the history and biography in rap or poetry. Use your imagination and make classical music come alive. And by the way: after you complete your research, see how many of the composers pictured on this page can you identify. Once you have chosen a period of music and studied its history, your group needs to select a composer or two that represents it. There is a lot of exciting music from each period, and this list of Internet sites will give you composers' biographies, as well as a chance to hear their music. Put on the headphones, sit back, and enjoy the concert. And don't forget to crank up the sound! You can go to the New York Philharmonic site for kids and listen to music in the gallery of composers. You can also click on the "Create your own gallery" link. Once there, drag composer names from the lobby area to the gallery area. Then you can visit the gallery and listen to music by each of your composers. Here are some representative composers and their music to help you get started. In the gallery find Rossini and listen to his Barber of Seville Overture don't sit down while listening to this one! At the gallery listen to the "Miracle Symphony"
The Sorcerer's Apprentice Mickey Mouse, anyone? Scroll down to Mahler and listen to the Symphony #1 fourth movementñvery dramatic! New World Symphony sounds like "Jaws" to me! One way you can organize your material is to use Kidspirations to develop a concept map or flow chart. You should now know quite a bit about a specific period of music history. As you can see, "classical" really is not just classical music. That is only one period of music history, though we use its name to describe all "serious" music from the Middle Ages to the 20th century. At the end of all the groups' MTV presentations, you should also know something about the other major periods of music history. Which one do you like best? Which composer excited you most? Would you go out and buy a CD of your favorite classical composer's music? There are templates that create the WebQuest all on one page, and there are templates that distribute the sections among numerous pages. These are more complex to manipulate. When I teach my education majors at Trinity College how to create their first WebQuest, I give them an all-in-one template that I created. It uses modern Web standards and is very small in file size. This template is part of the compressed file at my site that I referenced at the beginning of this article. Assuming that most of you will opt for Composer, the directions will center on its use. 2. 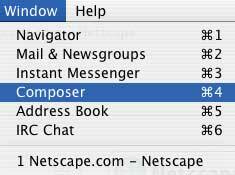 Go to the menu and find Window>Composer. 3. Go to File>Open and navigate to your template. 5. Highlight the text “Title Goes Here” and type the title of your WebQuest. 6. Highlight the “x” and insert the grade level for which you’re making the Quest. a. For the tutorial, type 5th grade. 7. Highlight the filler text and replace it with your name and email address. a. For the tutorial, enter your name and email address. 8. Delete the text that asks you to insert a picture. 9. Go to Insert>Image or use the Image button on your toolbar. 10. Browse for the image. a. For the tutorial, first choose “beethoven.jpg,” then “bach.gif,” then “tchaikovsky8.jpg,” and finally “Mozart.jpg.” After inserting each image, leave the cursor where it is and insert the next one. a. 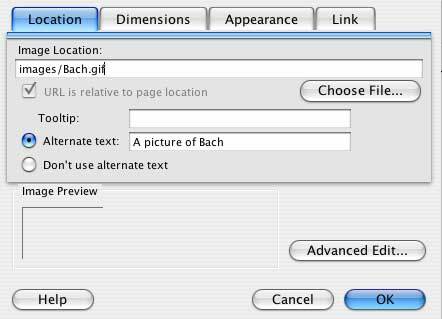 For the tutorial, add “Beethoven,” “Bach,” Tchaikovsky,” and “Mozart” for the appropriate images. Alternative text gives people with vision problems an idea of what’s in your image. 12. More advanced users can select the “Appearance” tab and choose a text-to-image alignment. Teachers who are new to Web page creation should just stick with the default and leave the image in a space by itself. In our case, we’re inserting four images one right after the other. 13. Now go to the text under the subtitle “Introduction” and delete the explanatory text. If you are creating an original WebQuest, enter your own introductory text. Do the same for “Task” and “Process.” You may want to use ordered (numbered) or unordered lists for these sections of the WebQuest. 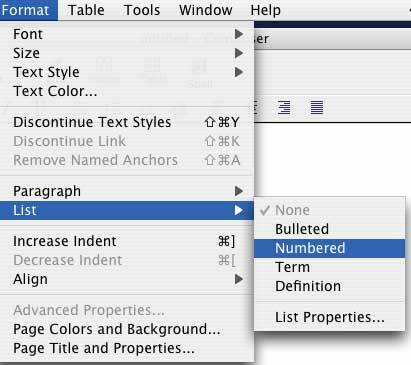 You may use your insert menu or the list icons on the toolbar. 15. For the rubric, you will need to modify the text in each cell. Delete the text in each cell and type in your own objectives. You may not want to use all rows of the rubric. If you want to delete a row, first put your cursor anywhere in the row. Then select the last <tr> (table row tag) you see at the bottom of your Composer window. Now press your delete key. The row will disappear. a. For the tutorial, we’ll just place some rubric text into each cell of the first row and practice deleting one row. a. For the tutorial, again, select, copy, and paste the appropriate text from the wq_text.txt document. 17. Enter your credits in the “Credits” area of the page. a. For the tutorial, select, copy, and paste the appropriate text. 18. You may change colors by using the toolbar. If you are familiar with Microsoft Word, you should have no problem highlighting (selecting) the text you wish to change, and using popup menus and other controls to create formatting. 19. Creating links: Select the text that you want to turn into a link. Click on the little chain button in the toolbar. That is a link button. Type in your link. Don’t forget to use the full http://www. Format. Just using www dot will not work. You must include the http://. a. If the text you are selecting (such as in our process area) is a complete Web address, first copy it before you open the link dialog box. You can go to Edit>Copy, then choose Edit>Paste. 20. You can change the background color of the page if you like. Choose the menu Format>Page Colors and Background. 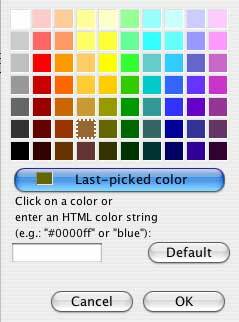 Click the button for “Choose Custom Colors.” Choose the button for “Background.” When the color chart appears, choose a color and click “OK.” Click “OK” again. The last part of a WebQuest, the credits and references, involves the discussion of some complicated issues such as education copyright and fair use. I will deal with these in part two of this article. I will show families and teachers how they can find images and evaluate the Web pages they will use as resources for the Quest. Part two will also deal with the common problems new WebQuest creators run into as they put together Quests. While you wait, I hope you’ll take a look at the wonderful WebQuests already available for you to play with at such sites as http://www.bestwebquests.com/ and http://www.webquest.org/.